After a bleak winter that had proved tremendously unsettling to the Southern cause, spring 1862 brought hope that the Confederates in the west might redeem their losses. Johnston concentrated his defeated forces near Corinth, Mississippi, for an offensive into Tennessee. He had pleaded all winter for reinforcements, but none were forthcoming until March, when he was able to muster some 40,000 troops to engage the enemy. Realizing that the Federals possessed superior numerical strength, the Confederates would have to pull off a stunning surprise and run Grant's army into the river before Buell arrived if they were to be successful. The concentration of forces brought together a colorful group of commanders, including Major-Generals Braxton Bragg and Pierre G. T. Beauregard, the hero of the Battle of First Bull Run. Johnston assumed overall command. Confederates, who fired an enormous volley, opening the Battle of Pittsburg Landing. To the Federals' surprise, the Confederates had struck at dawn. Major-General William T. Sherman, who had insisted that the enemy was no closer than Corinth, commanded the Federals near the church and was forced to form a line to hold off the Confederate wave. The Confederates thrust forward throughout the early morning hours, pushing the panic-stricken soldiers back toward the river. 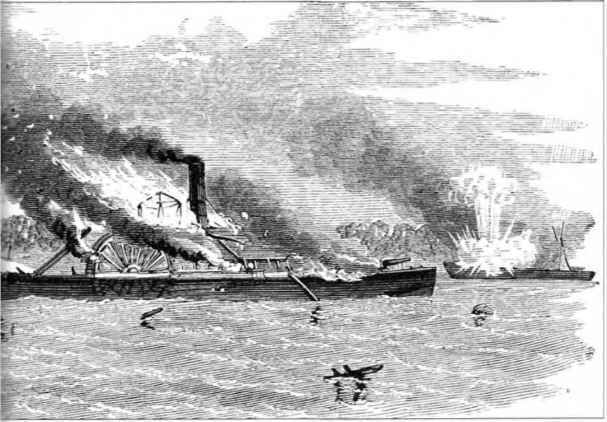 Although somewhat oddly formed and badly intermingled in its deployment, the Confederate offensive was nonetheless so successful that by noon thousands of the disorganized Federals had simply run for cover, some cowering beneath the river bluff, others swimming across the river for safety. Still, most of the Federal troops remained steadfast and throughout the morning both sides engaged in a horrific slaughter. charges and was mortally wounded. He bled to death while his personal physician was helping to care for captured wounded Federals. After several futile and suicidal bayonet charges, the Confederates positioned over 60 cannon in a semicircle to rain down several hundred shells on the Union stronghold. 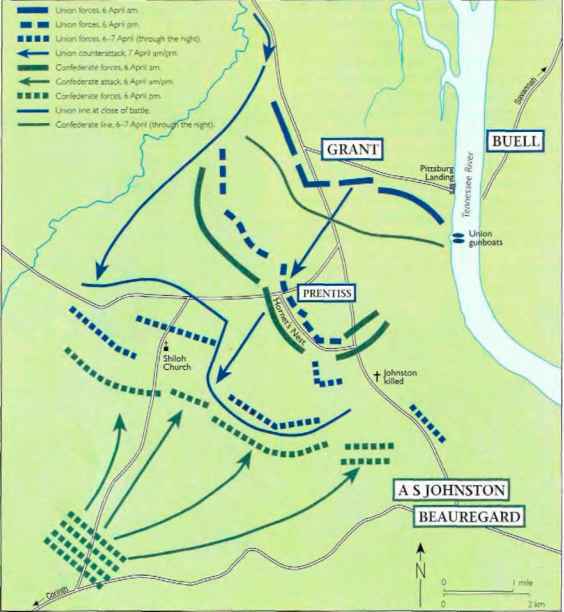 Practically surrounded, Prentiss reluctantly surrendered at 5.30 pm to save the 2,200 men left in his division. During the remaining hour of daylight, Grant struggled to reposition his artillery to hold oft the anticipated final Confederate thrust. As darkness came, so did the rains, and the merciless fighting ended. Southern combatants. When Beauregard realized that Van Dorn was not coming, and that his troops were nearly out of ammunition and completely exhausted, he ordered a withdrawal to Corinth. 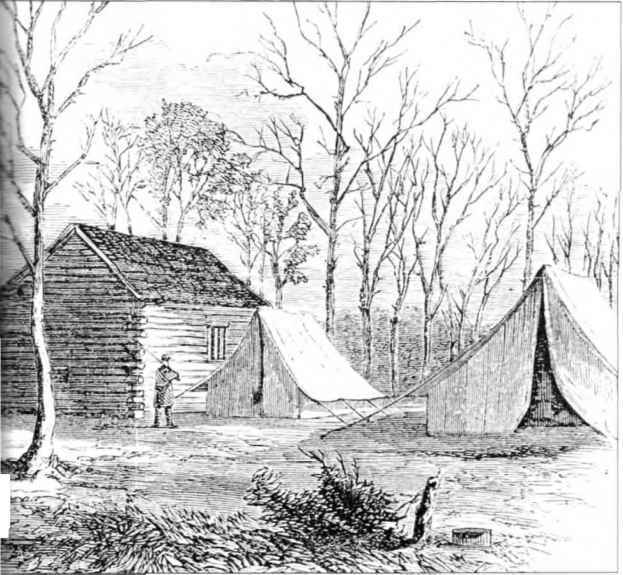 Grant decided not to pursue because his soldiers were just as exhausted and disorganized as the retreating troops. Perhaps even more stunning than the Union victory at Shiloh was Flag Officer David G. Farragut's capture of New Orleans. Louisiana, three weeks later. His wooden frigates and gunboats, carrying BrigadierGeneral Benjamin Butler's 15,000 soldiers, approached the forts protecting the mouth of the Mississippi River. After a week of bombarding the strongholds, Farragut's mortars failed to reduce the forts, so the determined sailor decided to run his flotilla by the forts. Before daybreak on 24 April, Farragut slipped his 17 vessels past the forts and moved upriver, though the Confederates managed to disable three smaller vessels. Less than a week later, Farragut's sailors and marines captured New Orleans without resistance as Brigadier-General Mansfield Lovell sent his forces away from the city. Simultaneously, General Butler forced the surrender of the river forts and then sent his men to occupy New Orleans. 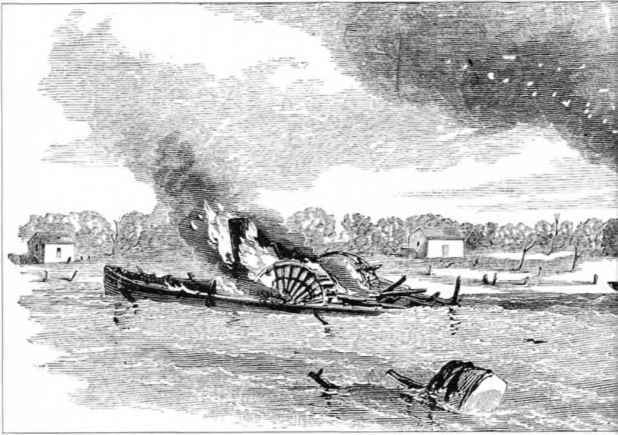 Not only had the Federals captured the Confederacy's largest city and leading port, but also the capture came on the heels of the defeat at Shiloh. Again the Confederates suffered the consequences of a lack of manpower to cover the vast western terrain. 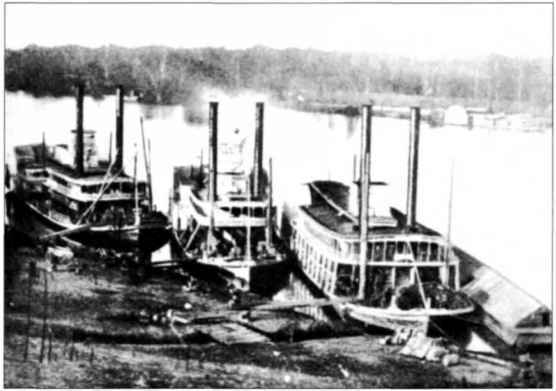 Confederate authorities believed that the main Union offensive was to come from upriver, so they ordered most of the soldiers and several gunboats north, leaving New Orleans vulnerable to attack. Confederates bitterly opposed this Act, arguing that it was an infringement of their liberties, others argued that the Confederacy with its limited manpower must raise troops and that states' rights would have to succumb to the Confederate cause. All white males between 18 and 35 years of age would be subjected to three years militan service. As the victory bells rang throughout the North in celebration of the accomplishments in the west, Southerners had no such expression. In fact, in stark contrast, church bells and plantation bells in the South were being melted down to be used in the war effort. At one point, Beauregard wrote to Father James Mullen of St Patrick's church in New Orleans that although 'our wives and children have been accustomed to the call, and would miss the tones of the "Church-going bells," ... there is no alternative we must make the sacrifice ... ' As much as he wanted to spare the necessity of depriving the South's plantations and churches of their bells, he simply could not. The war was heating up and Beauregard needed every available resource to carry on his operations to restore the Confederacy in the west.